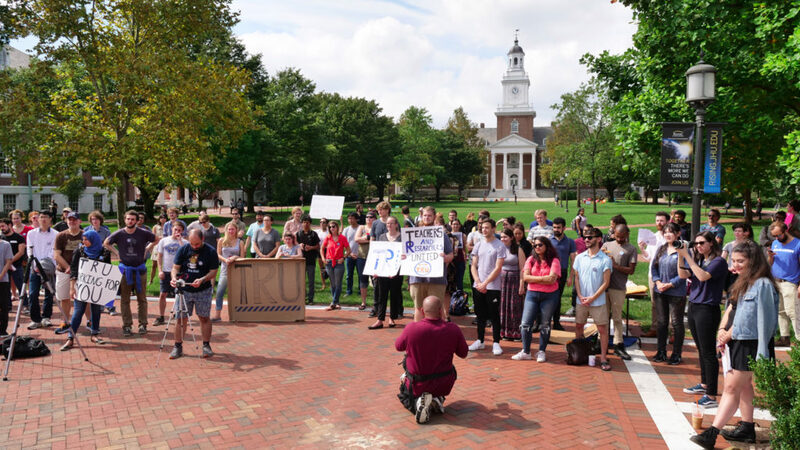 Note: This story was updated to include the accurate number of students at Hopkins Homewood Campus, and a statement made by Johns Hopkins University after time of publication. 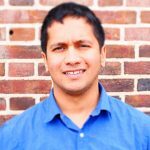 JAISAL NOOR: Dozens of graduate students and their supporters rallied at Baltimore’s prestigious Johns Hopkins University Wednesday, September 26 to announce their intention to unionize with Services Employees International Union, SEIU, and demand better working conditions and fair compensation. SAMANTHA AGARWAL: Organizers rallied here today to demand that graduate workers have a voice in the affairs of the university, that we have more power, and have our right to determine how our working conditions should be. JAISAL NOOR: There’s about  graduate students at the Hopkins Homewood campus, and organizers say they already have 200 signatures in support of the union effort. We reached out to Hopkins for a comment, but did not receive a response in time for the publication of this story. The students say they’ve been organizing for years, and already have victories under their belt. They point to improved healthcare benefits for graduate students they helped negotiate during the summer of 2018. Also speaking at the rally were nurses from Johns Hopkins Hospital, who are seeking to unionize with National Nurses United. Molly Hartman O’Connell is a graduate student of nursing at Hopkins, and a registered nurse at Hopkins Hospital. MOLLY HARTMAN O’CONNELL: And we’re here to support the graduate students who are trying to do something very similar here, with very similar complaints and demands. JAISAL NOOR: Nurses allege management has launched an anti-union campaign- something the hospital denies. MOLLY HARTMAN O’CONNELL: We have had an anti-union campaign waged against us since March, and we have still been growing in number. And I think that speaks to the belief that we have, the confidence we have in the union, and also the confidence we have in what we’re doing is right, and that in addressing our demands we’re going to make the hospitals safer for patients. I think similar to this, the grad students want to make the institution better for undergrads and for other students at the university, as well. JAISAL NOOR: The action comes a week after dozens of students, faculty, and community members marched through campus demanding Hopkins University end its multimillion-dollar contract with Immigration Customs Enforcement, or ICE. Organizers say these struggles are connected. SAMANTHA AGARWAL: Endorse and help organize the campaign to get Hopkins to withdraw its contracts with ICE, because we believe that a union should not only promote the interest of graduate workers, but also a more just society overall. And so today’s rally was about all that. It was about uniting with other workers from across university, including nurses who are in the middle of a fierce unionization campaign, which is facing intense repression. Some of the security guards were here, faculty members were here, and other students were here. And we believe that the only way that we can change the conditions of our work is to unite with all the workers from the university. JAISAL NOOR: We’ll continue to bring you coverage of efforts of Hopkins graduate students and nurses to organize. For The Real News, I’m Jaisal Noor in Baltimore. Johns Hopkins has had a proud tradition of excellence in graduate education since the founding of the university more than 140 years ago. This tradition of excellence has been shaped by the outstanding contributions of our graduate students to our research and education missions. Johns Hopkins works to provide an environment conducive to our graduate students learning and training. We are always looking for opportunities to improve the graduate student experience, and have been discussing concerns, issues and ideas with our graduate student representatives for some time. Those discussions have led to several important initiatives, including a major expansion of health benefits this summer, a broad new parental leave program in 2017 (see sixth paragraph in this story), investments in career services for graduate students, and a new website and online database for transparency in doctoral programs. We believe that at the heart of our graduate students’ educational experience are the relationships they develop with their faculty advisors. These advisors are teachers, sounding boards, research collaborators, and mentors. This unique relationship has no analogue in the professional world. Johns Hopkins welcomes the discussion on campus about how to continue to improve the graduate student experience.